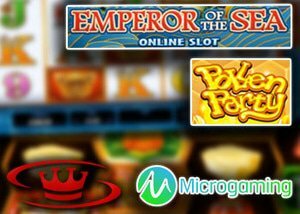 Microgaming, an internet software company focused on internet betting, announced that two new games are slated for release during the month of March: Emperor of the Sea and Pollen Party. The new games come on the heels of several new released during the month of February, including Fruit vs. Candy and Classic243. March is shaping up to be just as exciting with its multiple releases. The new Pollen Party slot is uniquely designed in the shape of a honeycomb and focuses on the life of its inhabitants, the bee. Offering 5 reels, and 720 ways to win, it includes a host of features such as a babe bonus, wild symbols, scatter and free spins. Symbol wise, you can look for honeycomb, a variety of bees, and honey jars. Emperor of the Sea, on the other hand, offers a Chinese theme based on traditions of this culture and includes many of the things associated with those traditions such as ornate pots of gold, ships, turtles, dragons, and others. It offers the unique opportunity to play 36, 68, or 88 paylines, and features wise, stacked wilds, expanding wilds, regular wilds, and rolling reels are in place to help you win big. Microgaming has stated that the month is reeling in a fantastic selection of games, both of which have unique qualities. Pollen Party is the first to offer 720 ways to win for the company and Emperor of the Sea is a great addition to their growing list of Asian-themed video slots that encompasses the many elements that make up this diverse and culturally rich country. One of the casinos that will be adding both new games to its library of video slots is Roxy Palace Casino. They currently are offering a $10 Microgaming no deposit bonus when you register today with Roxy Palace. This casino offers the full library of Microgaming games and new games are always on the horizon ready to entertain you with exciting features and big win opportunities. Once ready to deposit, you will be welcomed with a 100% match bonus valued up to $350! Register today, claim your no deposit bonus and start winning the Roxy way!